– The fully-blown GLC 63 S AMG did the North Loop in 7 minutes and 49.369 seconds. – The Affalterbach SUV beats the previous lap holder Alfa Romeo Stelvio Quadrifoglio (7 minutes and 51.7 seconds) by more than two seconds. – Powered by a twin turbo V8 producing 502bhp and 700Nm. Mercedes-AMG said they aren’t interested in Nurburgring time records except in the case of their upcoming One hypercar back in May. But then the German carmaker went ahead and set a lap time of 7 minutes 25.41 seconds with the AMG GT 63 S 4-Door claiming it to be fastest “four-seater around the ‘Ring”. Now, the guys from the Affalterbach are back after breaking the Nurburgring lap record for the fastest SUV around the North Loop. The GLC 63 S AMG went around the Green Hell in just 7 minutes and 49.369 seconds. That’s almost two seconds quicker than the previous record holder – Alfa Romeo Stelvio Quadrifoglio (7 minutes and 51.7 seconds). AMG development engineer Markus Hofbauer was behind the wheel of the record run. And the carmaker claims that Markus broke the previous record in just his first attempt. The 4.0-litre twin turbo V8 under the hood of the AMG SUV is capable of punching out 502bhp which is identical to Stelvio QF’s 505bhp. But the German churns out 700bhp compared to Alfa’s 600Nm from its 2.9-litre V6. 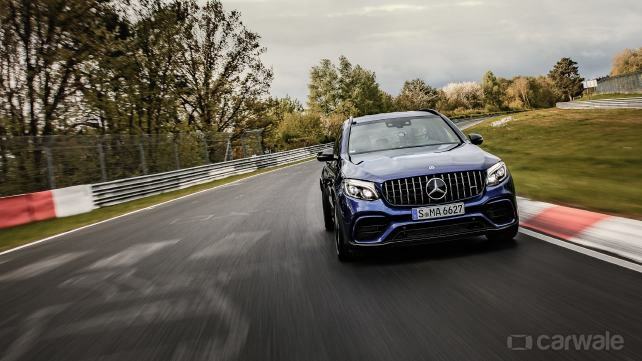 Moreover, the GLC 63 S comes fitted with air suspension and AMG’s 4MATIC+ all-wheel-drive with variable torque distribution to keep everything in check on a hot lap at the German racetrack. It is also helped by rear axle locking differential and ceramic composite brakes. Now what remains to be seen is how long Mercedes-AMG can wear the title of the ‘Ring record. Because Lamborghini will surely attempt to break this record with its ‘fastest SUV in the world’ – the Urus. Meanwhile, Porsche will remain a spectator and we could expect to see the fully-loaded Cayenne Turbo S E-Hybrid going down the German track in an attempt to be crowned the king of the Ring.